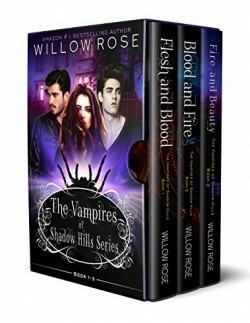 For fans of Twilight and The Vampire Diaries comes a new addiction impossible to put down. Readers are raving about this series! All ten books in the series are out now! Start Binge-reading today! Robyn can’t picture life without her childhood best friend Jayden. And now that they’re in high school in the sleepy town of Shadow Hills, she’s hoping they can take their friendship to the next level. But when their parents suddenly forbid them from seeing each other because of a centuries-old family quarrel, the few blocks between them might as well be worlds apart. She also can’t help but wonder if the flirty new girl in their neighborhood with her sights set on Jayden has put another nail in the coffin. While her parents keep her under lock and key, they let her older brother roam free late into the night… even after a local girl is found murdered. Between her brother’s nighttime excursions and her parents’ odd behavior, Robyn starts to worry that the killer may be living under her own roof. When danger lurks around every corner, Robyn must decide if she’s willing to risk her family and her life for a chance at true love. This is the first three books in a fun and frightening series of romantic paranormal mysteries. If you like star-crossed chemistry, headstrong heroines, and riveting family drama, then you’ll love Willow Rose’s heart-throbbing series.